42.47 miles! 24.8 running. Wow. This body of mine is surprising me. 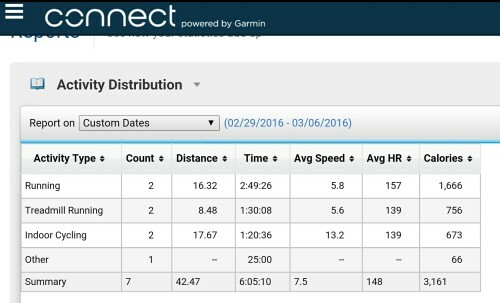 And yes, that is a training distance PR. I’ve never hit more than 40 in a week, even when I was triathlon training two summers ago. I told myself I wanted to get back into triathlon shape and while the scale isn’t quite where I want it, the speed and strength are definitely coming along. I rode my bike this morning as substitute for a foundation run and it was surprisingly easy in the same gear that I have been using on the trainer. I’ll take it! The hip still aches after runs, but it is becoming much less noticeable. I was prepared for the absolute worst after my 10 miler on Saturday, but it surprised me. I stretched it out at every stop light and made a huge effort to stretch it multiple times the rest of the day. 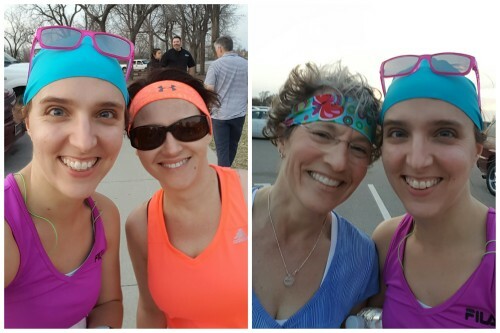 I was even able to run a 10K with my Mom and Bestie the next day. More on that later. I’m on a 9 day streak of using MyFitnessPal to log my food intake. I haven’t seen as much improvement as I hoped, but to be honest I’ve caught myself cheating a bit here or there. I had three really good days in a row where I logged every single thing. The weekend derailed that, especially Saturday when I felt like I could eat whatever I wanted. Nope. I still need to eat clean(ish) and keep my treat foods to small portions. So that 10K…first “race” of 2016. I knew that after running 10 on Saturday, I would be in no shape to run 6 miles hard. I decided to run with my mom and my bestie at their pace. It made the race a heck of a lot more enjoyable. There was absolutely no race anxiety, which I have been plagued with for about 18 months now. I realized about halfway through the run that I hadn’t even thought about bringing fuel or a water bottle. I didn’t even bring my beloved, never-leave-home-without-it BASE salt. It felt just like a spur of the moment 6er at 5pm with my favorite girls. I need to do more races like that. Just for fun. No PR pressure. And now for something completely random, but it’s exciting in my world. Check out my new tote bag! Ever since high school I have felt like my life has been a mission to find the “perfect purse.” It’s a struggle to be sure. At different times in my life, I have carried a different size and variety of stuff. 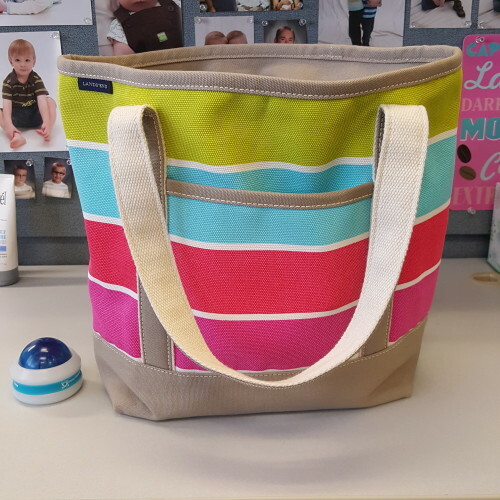 When I got pregnant with Runner Boy, I bought a traditional diaper bag, but I quickly realized I didn’t like it. I just used big purses and would shove diapers, small toys, and wipes in it. Fast forward to post-potty-training, I bought cute little bags that just held my phone, cards, and chapstick. That is all fine and good, except I like to have my training binder, my Believe journal, a running book, and a for-pleasure book with me too. After an exhaustive search and too much money according to Mr. Neon, I FINALLY caved and bought a Lands End zip-top tote. This is the medium size. It has a bunch of pockets on the inside and a big place for me to keep all my books organized. I dig it! Are you tote bag obsessed? Do you have race anxiety? Is this post random enough for you?